I’m grateful for your willingness to serve, I’m proud of the accomplishments of our state and its citizens, and I’m optimistic that this legislative session provides us with a unique opportunity to advance needed reforms in a variety of different areas that will strengthen our state and benefit the people now and in the future. Having spent three terms in a different legislature, a prison known as the US House of Representatives, it is quite a privilege to be able to work with a legislative body that has demonstrated the ability to get things done and to lead. I’ve already seen it firsthand. Two years ago, the Florida Legislature unanimously passed a resolution acknowledging and apologizing for the “gross injustices” perpetrated, in the middle of the last century, against four African-American men --- Charles Greenlee, Walter Irvin, Samuel Shephard, and Ernest Thomas --- known as the Groveland Four. The resolution requested that the Governor review their cases and issue pardons for these men. Upon taking office in January, I took action. Joined by our Cabinet members, I approved pardons for all four men a few days into my term. It’s never too late to do the right thing. And that we here today are united in insisting that the constitutional protections central to a free society are honored for all of our citizens. Members of the House and Senate, thank you for leading the way. I observed during my inaugural address that, in the words of Alexander Hamilton, energy in the executive is the leading character in the definition of good government. I believe it and I’ve worked to exemplify it. --- Reorienting our environmental policy around the goal of cleaning up our water. --- Announcing far-reaching education reforms designed to make Florida No. 1 in skills-based education by 2030. --- Securing hundreds of millions of dollars for storm-ravaged parts of Northwest Florida. --- Bringing accountability to entities ranging from the Broward Sheriff’s Office to the South Florida Water Management District. --- And appointing three spectacular justices to our Supreme Court. I’m proud to recognize the efforts of my wife Casey. She has been by my side as we have toured the state and has also blazed her own trail on issues like education, disaster relief and freedom for the people of Venezuela. She has worked so hard and one thing is clear: we have a great First Lady. I’m convinced that this whole Governor thing is just a way for the people of Florida to have Casey as their First Lady. Our kids Madison and Mason have taken over the Governor’s mansion but the baby-proofing has been successful --- I can report that no artifacts of Florida history have yet to be destroyed. But stay tuned --- Mason will be walking very soon. Just last week, Casey traveled to Northwest Florida to survey the Hurricane Michael recovery efforts. We have both been to the region several times over the past few months. To the people of Northwest Florida: we pledged to stand with you as you work to rebuild your communities stronger than before – and we have followed through on that pledge. I’ve already traveled to Washington, D.C. and secured a historic commitment from the Trump administration to provide assistance to the communities that Michael battered. My administration has worked to cut through red tape to expedite relief efforts and, thanks to the leadership of your former colleague Jared Moskowitz, we are making great progress. Here with us today is Mayor Al Cathey and Administrator Tanya Castro from Mexico Beach, which was ground zero for Hurricane Michael’s wrath. They and many others affected by the storm have displayed remarkable resilience in the face of huge obstacles. They deserve our admiration --- and our support. These communities will not be rebuilt in days, weeks or months, but they will be rebuilt. They will be rebuilt because we as Floridians will answer the call as we always do. God bless the good people of Northwest Florida. Executive energy and leadership are necessary to meet fully the challenges that are before us --- but they are not sufficient. In a constitutional system with separated powers, we --- the political branches --- must work together so we can build off the foundation that has been laid and set the stage for the future success of our state. How can we accomplish this task? I answer simply: be bold --- be bold in championing economic opportunity, be bold in protecting Florida’s environment, be bold in improving education, be bold in defending the safety of our communities, be bold because while perfection is not attainable, if we aim high we can achieve excellence. Florida is blessed with some of the nation’s finest natural resources. We are the fishing and boating capital of the United States. Our beaches bring millions of tourists to our state each and every year. The state’s unique natural environment is central to our economy, our quality of life, and our identity as Floridians. --- Expediting key projects like the EAA reservoir and raising the Tamiami Trail. --- Establishing a blue-green algae task force to develop policies to fight algae blooms, fight red tide and improve water quality. --- And appointing a Chief Science Officer to better harness scientific data and research in service of Florida’s most pressing environmental needs. We have a bold vision, we have good folks in key positions, and with your support for these initiatives, we will restore and preserve the beauty of Florida for generations to come. It is often said that states serve as laboratories of democracies and we are in the midst of a great experiment among the states regarding taxation and government spending. The result has been a migration of wealth from states that tax heavily, spend profligately, and regulate excessively to states, like Florida, that tax lightly, spend conservatively, and regulate reasonably. In the face of these trends, some of the states that have hemorrhaged businesses and taxpayers have decided to double down by raising existing taxes and imposing new taxes. As George Harrison once observed: If you get too cold, they tax the heat; If you take a walk, they tax your feet. We are a mobile, highly-connected society and as taxes become more onerous and as the business climate deteriorates in these states, people vote with their feet. The tax base erodes and the fiscal situations of these states gets more ominous, yielding massive budget shortfalls. We won’t repeat those mistakes in Florida. We will always remain a low-tax state. And we will never have an income tax! I have proposed more than $330 million in tax relief for Florida families, including a property tax cut. We must keep our economic momentum going! To those doing business in states that have a bad business and political climate, my message is this: come to Florida. We will maintain a healthy economic environment, we welcome your success and we won’t chase jobs away through economic ignorance and demagoguery. We are also committed to modernizing our infrastructure, and I know President Galvano is focused on making that happen.Thank you, Mr. President for your efforts. There are areas where Florida can do better. I hope the Legislature passes legislation to reform the issue of AOB, which has become a racket. And it’s clear we need reform of our occupational licensing regime, which borders on the absurd and primarily serves to frustrate opportunities for Floridians. You can become a sniper in the Marine Corps by completing training for 79 days, which equates to 632 hours; becoming a licensed interior designer in Florida requires 1,760 hours. You can earn jump wings by completing Army Jump School in three weeks, or about 168 hours; Florida law requires 1,200 hours to become licensed as a barber. Our DBPR secretary and your former colleague Halsey Beshears has identified a number of these requirements that need to be streamlined, rolled back or eliminated. This project merits your support. Maintaining low taxes and a healthy economic climate are important, but the most important factor regarding Florida’s economic potential is human capital. If we support our university system, our state colleges and primary and secondary education, as well as the reforms needed to improve educational opportunities across the board, then we will be setting the stage for future economic success that will be the envy of the nation. I’m proud that Florida’s university system is ranked No. 1 in the nation --- ahead of Texas, California and New York. This wasn’t always so; the climb atop the rankings has been remarkable. I’m not sure how many people outside Florida realize this, so I’m doing my part to spread the word. I was in New York last week meeting with business leaders and stressed this fact and pledged that we will do even more to build a world-class talent pool. We are poised for growth in finance, technology, health care, aerospace and more --- let’s support the continued ascent of our universities so that these industries can grow by employing our own graduates in good, high-paying jobs in our low-tax, business-friendly environment. Attending a traditional four-year brick-and-ivy institution is one way to get the advanced knowledge and skills necessary for achieving economic success, but we must recognize that it is not the only way --- and for many it is not the best way. Skills-based education offers a focused, and often more cost-effective means, by which students can acquire the tools they need to be successful. Working with your former speaker and our Commissioner of Education Richard Corcoran, I have proposed a plan to take Florida from middle of the pack to No. 1 in workforce education by 2030. Earlier this year, I visited Tampa Bay Technical High School to observe a successful example of workforce education first-hand. I met Glenn Wester III, who is with us here today. Glenn is a junior in the welding program and, even though he is not quite old enough, has already received job offers --- good paying job offers! He is also taking Advanced Placement courses and will have to choose between multiple pathways for success. Glenn, keep working hard, we wish you continued success and I applaud the Hillsborough County School District for giving students like Glenn these opportunities. Our workforce education initiatives include grants to place students in apprenticeships, money to train teachers in computer science and funds for workforce programs within our state college system. These reforms will make a difference and deserve your support. 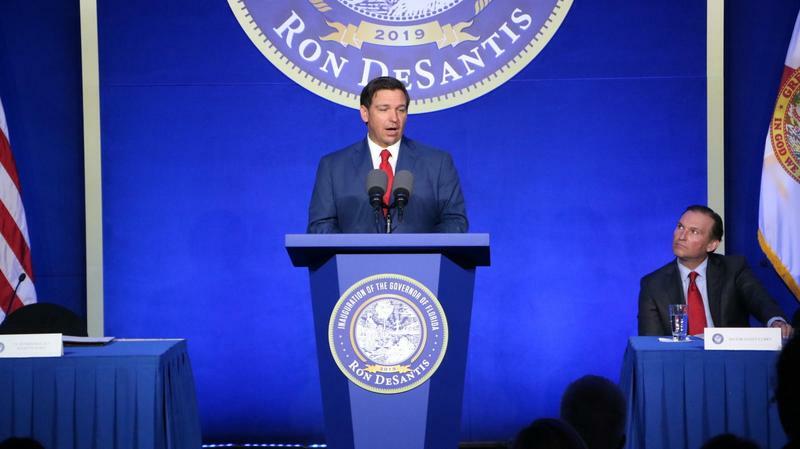 Florida has made strides in primary and secondary education since I graduated from public school in Dunedin in 1997, but we have a lot more to do. For years, I’ve heard from parents and teachers about the problems with a system of standards, testing and curriculum modeled after common core. Parents have been especially frustrated by not being able to help their kids with basic math problems. So I have instructed Commissioner Corcoran to spend the rest of this year engaged in consultation with parents, teachers, school administrators, and employers so that we can replace common core with high-quality curriculum, streamlined testing and a new emphasis on American civics. We want a system that demands excellence and that also engenders public confidence. We also need to do more to recruit, retain and reward great teachers. To this end, I have proposed replacing Best and Brightest bonus program with a revised $423 million program that will reward more than 40,000 teachers with bonuses approaching $10,000. I’m also requesting $10 million for a tuition and loan forgiveness program for as many as 1,700 teachers who commit to teaching in Florida schools for five years. Attracting and keeping great teachers in our classrooms should be a high priority. Education opportunity shouldn’t be limited by parental income or Zip code. One way Florida has expanded opportunity has been through the Tax Credit Scholarship program for students from low-income families. More than 100,000 students --- nearly 70 percent of whom are African-American or Hispanic, with an average family income of roughly $26,000 per year --- are utilizing the scholarship. The results have been positive: the Urban Institute recently released a study that found tax credit scholarship students are 43 percent more likely to attend a four-year college and up to 20 percent more likely to obtain a bachelor’s degree. Students who use the scholarship more than four years are up to 99 percent more likely to attend college and up to 45 percent more likely to earn a bachelor’s degree. More low-income families would like the opportunity to obtain a scholarship for their kids. There are currently 14,000 students who qualify for the scholarship but are stuck on the waiting list. Shareka Wright is a single mother of three who supports her family by driving a garbage truck for the city of Orlando. While one of her sons is doing well in an Orange County district school, her two younger boys needed a different environment, as one struggled academically and the other was bullied. But because her boys are on the waiting list for the tax credit scholarship program, Shareka might not be able to afford to keep them in this more favorable environment. Shareka is doing her best to give her boys a better future. I’m not satisfied to see hard-working parents like Shareka mired on a waitlist, and so I’m proposing to eliminate the waitlist by creating a new Equal Opportunity Scholarship that is similar to the tax credit scholarship. We are a big, diverse state and one size doesn’t fit all when it comes to education. Let’s stand with working moms like Shareka and empower them to choose the best learning environment for their kids. We also need to stand by students with special needs and their families. That means eliminating the waitlist of 1,900 students for Gardiner Scholarships. Donna and Michael Holt are here with their son Levi, who has Down syndrome. Levi is on the waiting list for a Gardiner scholarship. Students like Levi have unique abilities that require a customized learning environment that the Gardiner ESA can provide. The Gardiner scholarship is our way of saying that everyone counts and that these are lives worth living. And while we are at it, I wholeheartedly reject the callous disregard for human life displayed by the Governors of Virginia and New York. We won’t allow that to happen in Florida. We need to enact policies to make health insurance, prescription drugs and medical care more affordable for Floridians. Any proposal that seeks to eliminate the private health insurance policies of millions of Floridians is unacceptable. Government has no right to take away the policies that Floridians earn through their jobs or purchase on the individual market. I want Floridians to be able to purchase prescription drugs from Canada at lower prices. There is an avenue under existing federal law to accomplish this; the President is supportive of this effort and has asked me to plow ahead, which will require navigating an institutionally hostile bureaucracy. This could save money for individuals, reduce costs for businesses and relieve pressure on our state budget. I’m also open to any ideas that the Legislature has to tackle this problem. 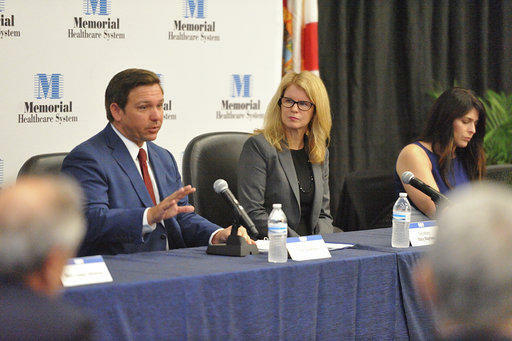 One thing is clear: Floridians need relief from the rising costs of prescription drugs. Bringing price transparency to health care can also help reduce costs, and I have instructed Secretary Mayhew from AHCA to expedite the price transparency database that the Legislature required. To make the tool effective, we need legislation to provide for shared savings policies so that patients receive a financial benefit when they choose a more cost-effective option. I’m supportive of Speaker Oliva’s call to foster innovation and competition in our health care system. We can’t just continue doing the same thing over and over and expecting a different result. Last year at this time, the state was still reeling from the massacre at Marjory Stoneman Douglas High School. Out of that tragedy grew the MSD Commission, which earlier this year outlined a series of recommendations to improve security at Florida schools. I support the recommendations and ask that you enact them into law. These reforms are a testament to the tenacity, courage and character of the families of the Parkland victims. The hard work of those like Ryan Petty and Hunter Pollack, who is with us here today, has already helped save lives and has made our state stronger. They should be commended for their efforts. I have gotten to know a number of the families and one thing that has stuck with me is something I’ve heard a number of them say: that this was the most preventable school shooting in history. When I took office, many of the Parkland families felt that there had not been any accountability --- at the school district or at the sheriff’s office --- for the string of failures that culminated in the massacre. So, I acted by successfully petitioning for a statewide grand jury investigation into school security failures in Broward County and other jurisdictions. I also suspended Scott Israel as the Sheriff of Broward and replaced him with Gregory Tony. That suspension will come before the Senate soon and the failures of the former sheriff are well-documented. Why any senator would want to thumb his nose at the Parkland families and to eject Sheriff Toney, who is doing a great job and has made history as the first African-American sheriff in Broward history, is beyond me. But I judge not, lest I be judged. Florida will not be a sanctuary state --- we won’t allow someone here illegally to commit criminal misconduct and simply be returned to our communities. And we won’t tolerate sanctuary cities that actively frustrate law enforcement by shielding criminal aliens from accountability at the expense of public safety. Here with us today are two angel parents, Bobby and Kiyan Michael from Jacksonville. Their son Brandon was killed by a foreign national who was illegally in our country and who been deported on two prior occasions. Brandon was a young man engaged to be married, but instead of planning a wedding Bobby and Kiyan had to plan a funeral. Had our laws simply been enforced, Bobby and Kiyan might not have had to bury their son. Let’s do right by the Michael family; lets prohibit sanctuary cities in Florida. International events usually have a particular resonance in Florida. Earlier this year, I had a meeting in the Oval Office alongside Senators Rubio and Scott as well as Congressman Diaz-Balart about the dire situation in Venezuela. To the President’s credit, he heeded our advice and recognized Juan Guaidó as the interim president and made clear that the dictator Nicolás Maduro has got to go. The tragedy in Venezuela is a result of a failed socialist experiment --- a system that is hostile to human liberty and contrary to human nature. The tyranny that has resulted is the natural outgrowth of trying to impose this failed ideology on the people of Venezuela. To the Venezuelan exile community here in Florida, we stand with you and with the people of Venezuela who are seeking freedom and a better future for Venezuela. The eyes of the free world have descended upon Venezuela, and it is imperative that freedom prevail. We also know that the despair in Venezuela wouldn’t be possible without the nefarious influence of the Cuban government. I applaud the President for allowing the application of Title III of the Libertad Act and support additional efforts to hold the Castro regime accountable. I would like to see the Castro regime go the way of Maduro and to see a free and democratic Cuba take its place. I offer my thanks to the Legislature for defending the U.S.-Israel relationship by enacting anti-BDS legislation. I reject attempts to target Israel for disfavored treatment and will enforce the anti-BDS provisions vigorously. This whole enterprise of targeting Israel for economic harm is such a fraud and merely a cover for anti-Semitism. In Florida, rest assured that BDS is DOA. We will be taking a delegation to Israel in May and I look forward to furthering the relationship between Florida and Israel. The lesson I learned from this is that sometimes it pays to be at the right place, at the right time. I think we here in this chamber are the right leaders at the right time. After all, many are called to serve in elected office, but only a few are actually entrusted with authority by the voters. Fewer still are presented with the opportunities we see before us today. Let’s fight the good fight, let’s finish the race, let’s keep the faith so that when Floridians look back on the fruits of this session, they will see it as one of our finest hours.